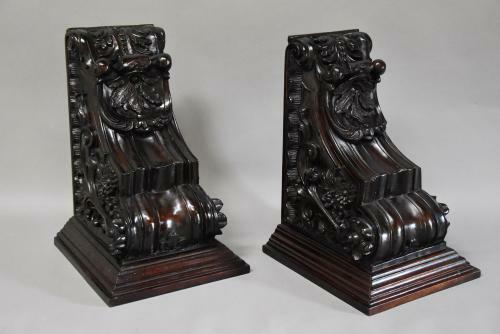 This pair of brackets consist of solid mahogany tops with a moulded edge leading down to a shaped and carved design with superb floral and foliate carved decoration. These brackets are highly decorative pieces and could be used as brackets in an architectural context, brackets to display sculptures etc or maybe as large bookends. The brackets are in excellent condition for age and can go straight into a home.